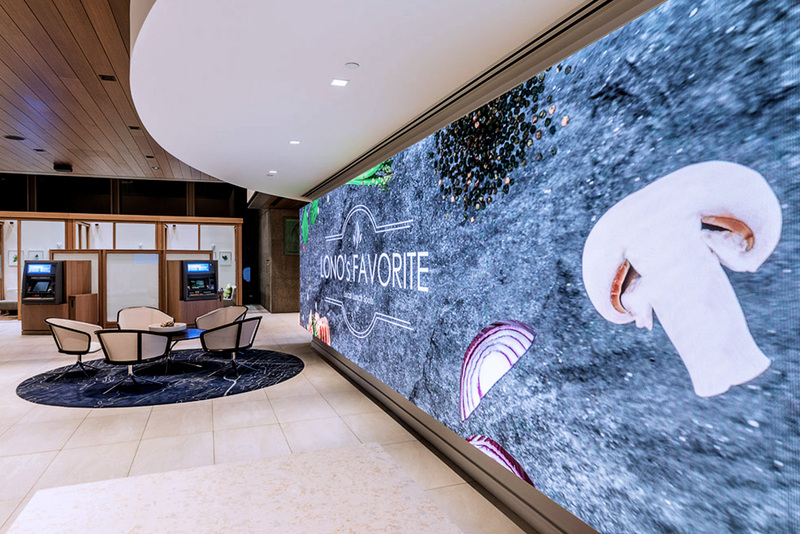 This is a good example of what I call the new lobby water fountain – a tight pitch LED video wall that’s the visual centerpiece of a big bank renovation. In the old days, big companies and office property developers put in water features in the lobbies and common areas. Now they’re putting in LED walls with experiential or branded content. In this case, it’s the newly renovated Bank of Hawaii main branch location in downtown Honolulu– billed as a Branch of Tomorrow. The branch also has a new open floor plan, new finishes, private transaction rooms, upgraded easy-deposit ATMs and tablets for more personal interactions. 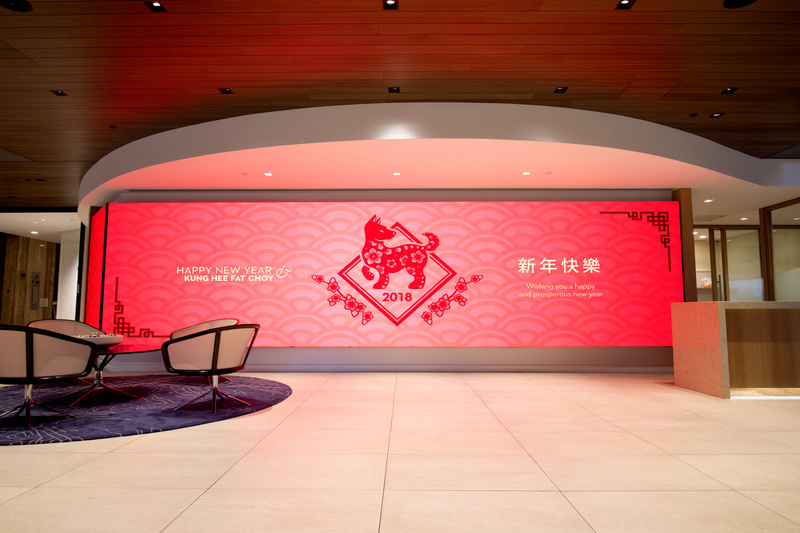 The 3mm lobby video wall – not quite the definition of fine pitch (2.5mm and under, generally) – spans the length of the bank’s entrance-facing wall. 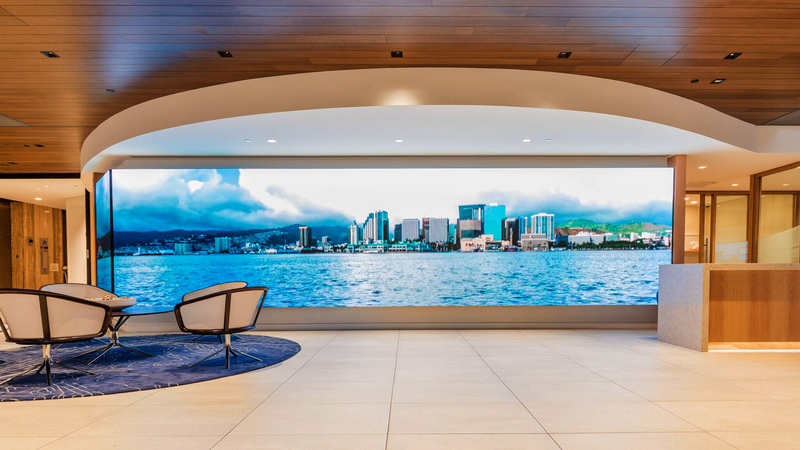 The Sansi display’s content rotates through bold, colorful imagery drawn from themes of a Hawaiian voyaging canoe. The 33-foot wide screen also runs bank promotions and other marketing campaigns. The 3,360 by 720 pixel HD wall was put in by Ford AV and, impressively, did the final install in less than three days. This is a good example of how HD works in LED. To get to somewhere between full HD and 4K, you need a canvas that’s more than 30 feet wide.